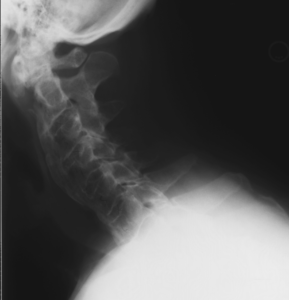 61 yo male with severe cervical stenosis and myelopathy - Matthew D. Hepler, M.D. 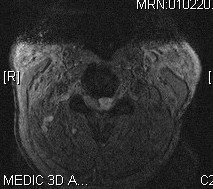 61 male who developed progressive neck pain and myelopathy with weakness in the hands and worsening ability to ambulate. 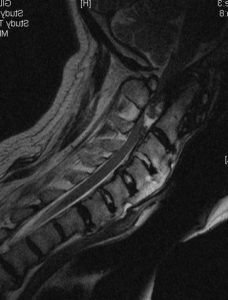 Preop imaging demonstrates degenerative changes at C1/2 with inflammatory pannus consistent with CPPD (Calcium Pyrophosphate Disease) producing severe stenosis, cord compression and myelomalacia changes (intrinsic damage to spinal cord). 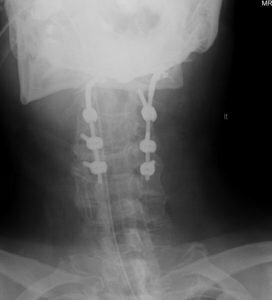 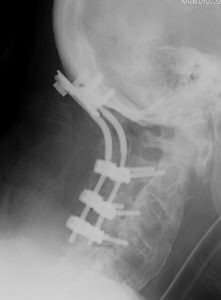 Patient was treated with posterior decompression with laminectomies at C1-2 and occipital-C4 fusion and instrumentation with marked resolution of myelopathic symptoms and improvement in neck pain.